Phoenix Coyotes thug forward Raffi Torres has been suspended indefinitely by the NHL after his disgusting hit on Marian Hossa in Tuesday night’s game. The league has requested an in-person hearing with Torres, and had reportedly asked for it to be on Wednesday but Torres and the NHLPA requested the meeting be pushed back. The meeting is scheduled for Friday. Some have speculated that Torres requested the meeting be pushed back in hopes a positive health report from the Blackhawks regarding Hossa might help his case with the league. My response: it shouldn’t. The health status of Mike Smith had no bearing on Andrew Shaw’s suspension, and whether or not Hossa plays in Game 4 or in October shouldn’t mean a thing to Brendan Shanahan’s ruling. Damn straight. If this is truly about changing player behavior, intent matters far more than the result. There is no question that Torres’ intentional illegal actions; charging, leaving his feet to finish a check, and intentional deliberate banned head contact are repeats of offenses which he has repeatedly been censured for by the league in the past. If Shanahanjob has any integity whatsoever, the suspension should be very long: perhaps the balance of the 2012 playoffs and the first 41 regular season games of next season. That jagbag should be unemployed. 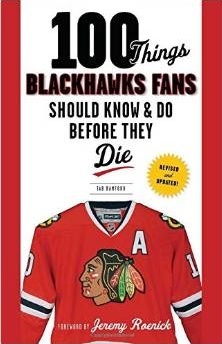 Unfortunately, its us fans and the Hawks that ultimately loose in this deal. Still, a very uneven exchange and to the benefit of the yotes when we lose a top gun and Phoenix loses a hack. How about the ref who was with in 10 ft of the play? Where is his suspension? mkz>>The only way the ref would have called a penalty on Torres would have been if Hossa was still mobile enough to “flop” around like Smith. This is total chaos, and it is not going to stop. Why? Ratings at TSN are up 56% over last year; NBC’s weekend games were up 50% over this time last year; Game 3 between Pittsburgh and Philadelphia was NBC’s most-watched non-Stanley Cup game since 2002. The NHL is reaping the whirlwind, in every way. And when it is done, we will count which bodies hit the floor, and which ones got up. Banks betting on houses took the entire world economy to the brink of collapse over the hopes of big bonus checks just 4 years ago. When looking at the ratings numbers above and the dollar signs they represent, fans are voting with their remote controls and tuning in. Money talks. Owners listen to the money, it’s only natural. The league is run by the owners. The owners see these ratings and salivate. Players need to start policing themselves again, because these owners are not likely to care about a few players getting carted off when compared to all the dollar signs from ratings. Brad-Good point I forgot the requirements for major penalties in the playoffs. Q said Hossa is out for tomorrow, (we all knew that would happen, Hossa is not a Oscar award winning hockey player) and Saad will play!!! Very excited to see him in action. Where is the player’s union in all of this? They are supposed to protect the players, including from each other. It’s pretty obvious the union only cares about how much money they can make in the next negotiation, not the health of the players. They need to get the players in line and start showing more respect for the game and their fellow players. They should be handing out some internal punishment and pushing for suspensions of officials by the league for some of the stuff that has been allowed to go on as the officiating in this year’s playoffs (in almost every series save LA-Van and NJ-Fla) has deteriorated massively. Lets face it if the NHL was serious about protecting players it have a zero tolerance policy. Any player who hits another in the head, intentional or not, is gone for the playoffs or the entire season if it occurs during the regular season. That will get players to keep their elbows down and feet on the ice. This crap about taking into account the health of the player who was hit is just that-CRAP!. Projected lines: Saad/Toews/Kane, Sharp/Kruger/Stalberg, Bicks/Bolland/Frolik, Bruno/Mayers/Bollig. Committed Indian or not, if that would have been a Hawks hit on Phoenix, my opinion would be the same – there is no place for that. 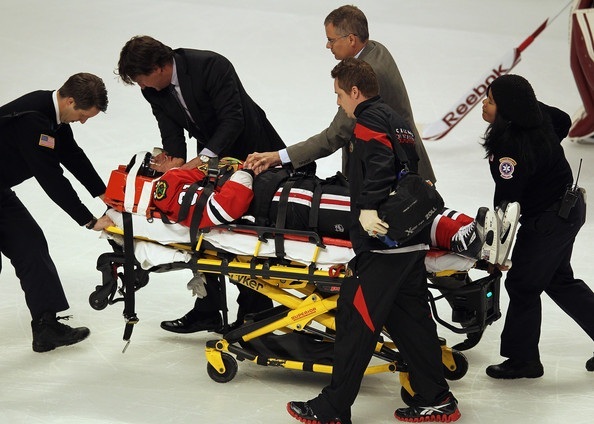 It actually made me sick to my stomach to watch Hossa get assaulted the way he did – I think we were fortunate that Big Hoss is made of steel and is a machine, because if that were Johnny Toews or Kaner, I don’t think they would be riding home in a car from the hospital. Praying for the big man and hoping Saad transitions smoothly into his new role (if he has one). Go Hawks and lets hope the league does whats right and suspend that orangutan looking Torres from the playoffs. The comments from Tippett and Don Maloney are a joke; they’d be crying like f’ing babies if it was one of their guy’s who got obliterated by a Hawk. The entire playoffs have deteriorated into a mess; executive league management (I use the word mangement very loosely) need only look in the mirror for an explanation of why every series has been marred by behavior and action that’s got to stop. I’ve been a fan of the greatest sport in the world since the mid-60’s and I’ve never felt more frustrated & embarrassed by what’s going on both ice level and in the rooms where league decisions are made. Bettman/Shanahan et al, should be ashamed of what’s been seen and allowed to fester and boil over on the ice. When the Hawks are done this tear, so am I. The playoffs are an officiating joke. Every game is a mess. Shanahack is so inconsistent it isn’t funny. Then Raffi tries to kill a guy without the puck and essentially out of the play AND gets to finish the game. Wanna get the players to police the game again? Quit with the suspensions and hand out losses. Think Torres’ teammates would defend him if it meant an automatic loss every time he did something stupid? Suspensions obviously don’t work. Torres should be suspended for the rest of the playoffs and 20 games next year. If your not going to make an example out of an obvious case like him, then who. What needs to be done here is very very obvious. And then if he does it again next year then ban him for life. I think its reached that point with this guy.